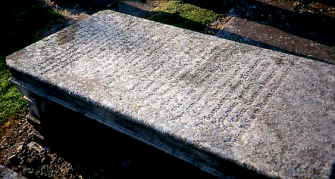 David Steel's gravestone is located in the old churchyard in the centre of Lesmahagow. This graveyard is usually locked, so access can be difficult. Still to the back did prove true steel. A play, True Steel, was written by Robert S. McLeish, based on the story of Steel's martyrdom. This has been performed a number of times, including at Strathaven in 2016, as part of the SCMA's 5oth Anniversary. David Steel was the shepherd at Skellyhill farm, which lies to the south-west of Lesmahagow. He was approached by the dragoons near to his house on 20 December 1686 and shot. He was 33 years of age. His corpse was brought to Lesmahagow and buried. A memorial at Skellyhill also commemorates him.